Autumn Snow, first ski of the ‘winter’ from the Aiguille du Midi. Waking up to yet more snow in the garden and a blue sky is pretty exciting. I got up early and started desperately messaging folk to try and find someone to come up and ski. 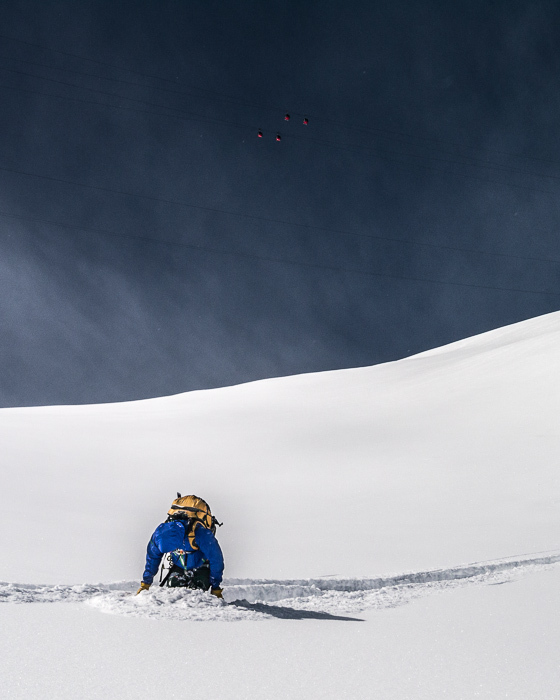 It certainly isn’t a normal days skiing this time of year as the high peaks and glaciers are only freshly covered in new snow, masking the crevasses beneath. This time of year most people in the valley are still psyched on climbing and a random day or two of snow doesn’t interest them. But as i’ll be training in Scotland for the whole winter, it seems too good an opportunity to miss. Some friends were keen, but as always the Midi lift is slow to open due to the snowfall. I had wanted to get to the market in town anyway and pick up some veg and cheese so it seemed a good moment. Crepuscular rays over the Lac des Praz, with the Petit Dru in the background. Heading into town on my bike I only got to the end of the village and as I looked around I slowed to a halt. 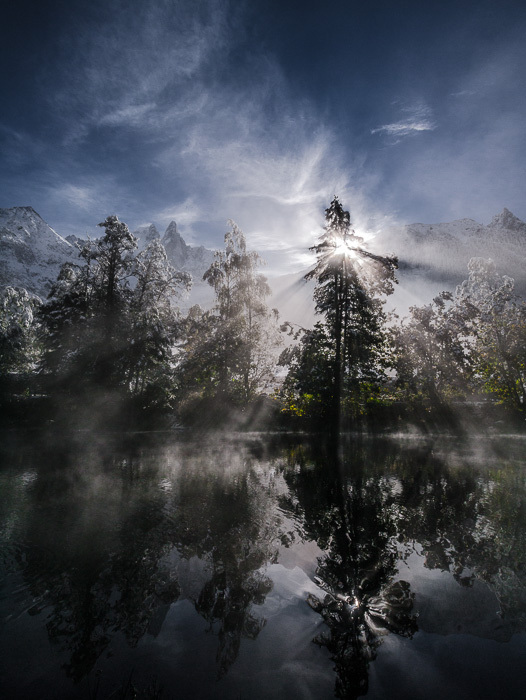 The small ‘Lac de Praz’ had a layer of mist swirling over it, the sun was filtering through the trees in crepuscular rays, whilst all around was covered in snow that was rapidly melting. I doubled back to get my camera and on return got overexcited rattling off 200 photos as the light shifted and the sun began to knock the snow off the trees. This took enough time that I had to abandon my mission to the market and head back home to collect my gear. I picked up my rucksack, skis and poles strapped to the side and cycled down to Chamonix to catch the lift. (My car has been left in the UK in preparation for heading up to Scotland!). Charlie Boscoe, Joel Evans and Matt Livingstone. Breezy on the arete before heading down the first few pitches of the Petit Envers. It isn’t actually that unusual to get snow fall right to the valley floor here in Chamonix in October. But it is a reminder to everyone to get themselves prepared for the season ahead. To the larch to drop their needles, the animals to gather the last nuts and to us to to tidy away anything outside we don’t want to loose for five months. 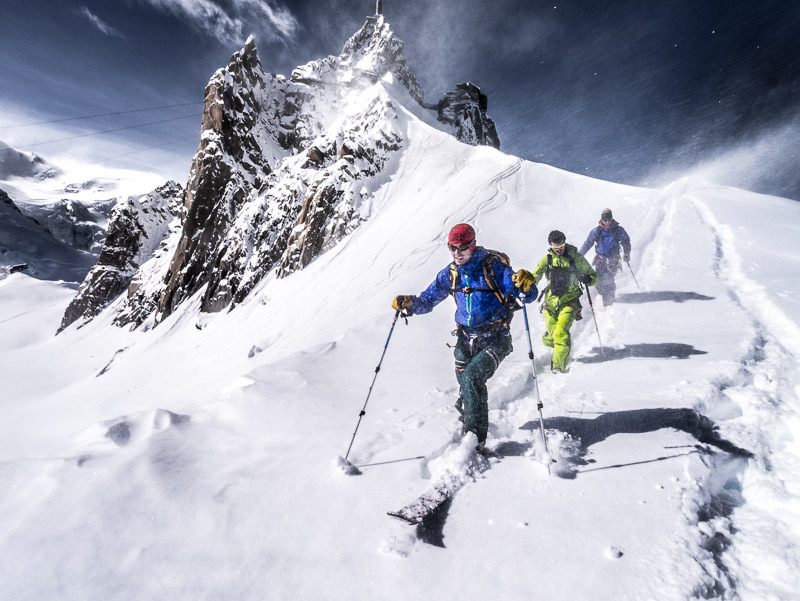 I looked through my diary and noted I had several days of great skiing up at the Midi in almost exactly the same week last year. 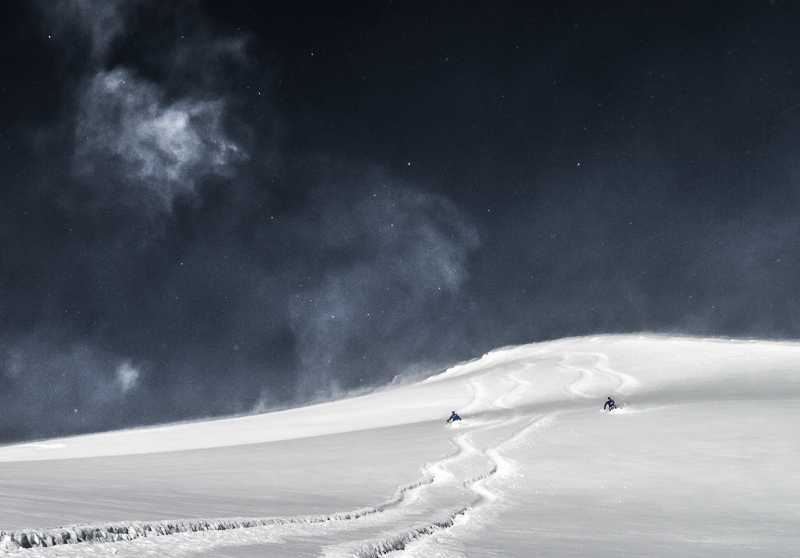 Charlie and Matt struggling to stay afloat in the powder! I actually missed the 11am first lift up in the end, so had to rush out to catch up with Tom Grant and the other folk. Getting out of the Midi didn’t feel like autumn at all, -18°C, 60km/h winds and masses of snow. I clipped into skis half way down the arete as the face down to the Col du Midi was irresistible. I caught up with the others just as they headed back up for another lap. 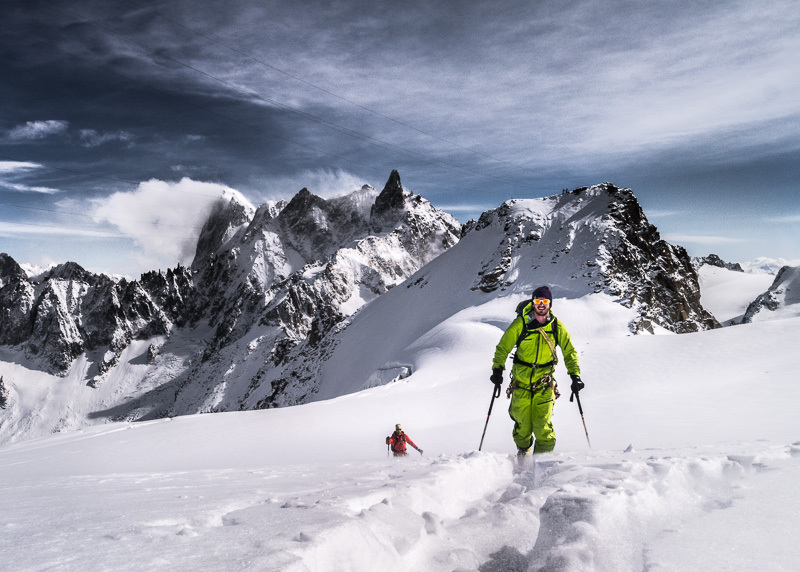 For a slightly longer ski we headed over to the first section of the Petit Envers variation of the Vallee Blanche which usually provides a good passage between the worst crevasses and some nice angled terrain. A mellow line can be taken most of the way but with this much snow it was difficult to keep sliding on anything less than 25°! A few pitches down and it is time to rope up, break trail back up to the top and repeat. Joel and Matt skinning back up to the Midi. Grandes Jorasses in the background.